In 2012, the North Carolina Society of Historians awarded the Paul Green Multi-Media Award to Walking in the Footsteps of Those Who Came Before Us, the DVD produced by Doug Chambers Productions which was directed by BRCO's Historic Preservation Committee. 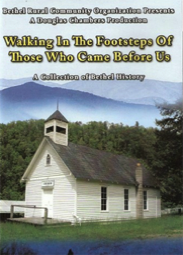 Walking in the Footsteps of Those Who Came Before Us DVD - Price $20.00 (price includes a $5.00 shipping and handling fee). Walking In The Footsteps of Those Who Came Before Us - Introduction from Douglas Chambers on Vimeo. "They Named This Pigeon Valley"
Pigeon Valley – Charles Cathey - Hear the stories of the passenger pigeons, Bethel Academy, & the industries of Woodrow. The Cathey House – Doris Cathey - Learn about the oldest remaining home in the Pigeon Valley which was home to five generations of Catheys where visitors may meet the ghost of cousin John Boone. Lenoir Devon Acres – Dr. Mary Lenoir Michal & Charles Trantham - This farm has been in business for over 150 years and is home to the docile red Devon cattle, brought here from Maryland during the mid-1850s. Bethel Presbyterian Church – Riley Covin and Bill Terrell - Listen to the story of the church’s formation, construction, and the changes it has endured. This is one of several buildings in the community built by master carpenter, the Reverend Jesse Stalcup. Inman Chapel – Ted Darrell Inman – “The Mayor of Bethel” tells the story of James Anderson Inman and the formation of this unique Universalist church where the first female minister in the area preached and instituted numerous social outreach programs. The Inman Family – Ted Darrell Inman & Malinda Messer - Hear the real story behind the fictional history of the Cold Mountain novel: the tale of William Pinkney Inman’s fateful journey home over Big Stomp Mountain during the Civil War. Alvah Sentelle. He was an educator, a Baptist minister, and a family man who raised nine children to adulthood. The Plott House – Richard & Jimmie Ellen Henson - This unique home was another building constructed by the Reverend Jesse Stalcup and has served as home to five generations of the Brown family. Francis Mill – Tanna Timbes - Follow the journey of this 120-year-old mill from a community gathering place to a disused relic and back to a beautifully restored, fully-working grist mill. Truss Bridge #79 – Ava Chambers Barrett & Troy Hargrove - The oldest metal truss bridge in North Carolina was almost lost in 1925 when it was replaced. A group of willing volunteers moved it to a new home where it gave them and their neighbors a better way across the river. Calvin Filmore Christopher – Berdine Hirschy, Winifred McNeil, & Eula Rigdon - This prolific inventor who lived in Bethel held over 100 patents, but very few people even know he lived here. Three members of the community who knew him personally recount their stories of this distinguished Southern gentleman. The J.B. Rigdon General Store – Berdine Hirschy, Winifred McNeil, & Eula Rigdon - Located in the heart of the community, this store was a central hub for mill workers, school children, and anyone else who made use of the fine goods stocked by owners Joe Berry and Rose Powell Rigdon. Bethel Community Cemetery – Malinda Messer - The community's oldest cemetery is situated on a hill with a panoramic view that overlooks many of the valley's landmarks. Here, William Pinkney Inman, Calvin Filmore Christopher, other prominent and not so prominent citizens are laid to rest.